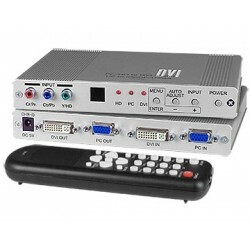 The VGA/Component Video/DVI-D Scaler/Converter scales and converts VGA, component video and DVI-D signals to a variety of digital DVI and VGA output resolutions up to 1920x1200. Enables you to view video from analog sources on digital HD displays. Output resolution can be selected from the OSD menu or front panel buttons. Upscales input video resolution up to 1080p for HDTV displays. OSD menu allows you to control color, resolution, brightness, contrast and horizontal/vertical picture adjustment. DVI input and output are both HDCP compliant. VGA output is turned off when the DVI input signal is HDCP encrypted. 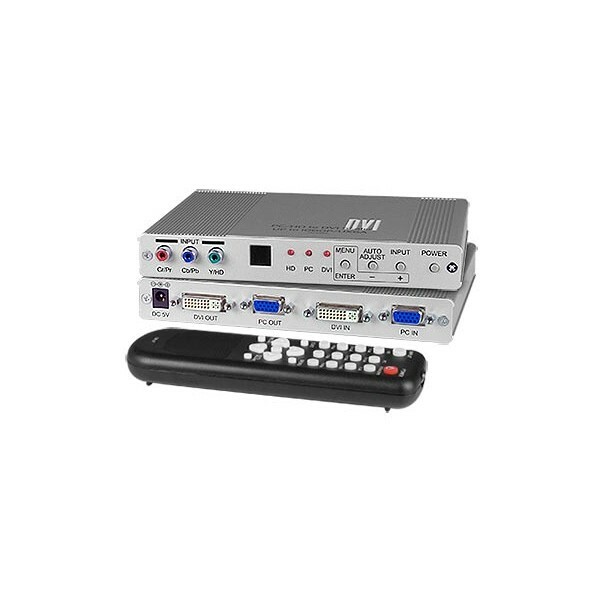 Ideal for viewing video from standard definition sources, such as cable or satellite receivers, on a high definition television or projector. 110 to 230 VAC at 50 or 60 Hz via AC adapter. One female 15-pin HD connector for VGA. Three RCA jacks for component video. One female DVI-I connector for digital DVI input. 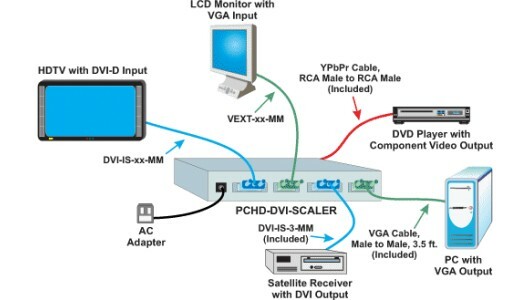 DVI input is HDCP compliant. Support 480i, 480p, 576i, 576p, 720p, 1080i and 1080p HDTV resolutions. Support VGA(640x480), SVGA(800x600), XGA(1024x768), SXGA(1280x1024), UXGA(1600x1200), WXGA(1366x768), WSXGA(1680x1050) and WUXGA(1920x1200) resolutions. Component Video: Supports 480i, 480p, 576i, 576p, 720p, 1080i and 1080p HDTV resolutions. One female DVI-I connector for digital DVI output. DVI output is HDCP compliant. OSD menu accessible via a front panel button. VGA cable, male to male, 3.5 ft.
YPbPr 3-RCA cable, male to male, 3 ft.
DVI-I cable, male to male, 3 ft.